Garmisch-Partenkirchen, Germany – Travis Ganong, of Squaw Valley, Calif., brushed aside a 15-minute course hold to win his second Audi FIS Ski World Cup downhill in Germany on Friday, leading five Americans into the top 30, while teammate Steven Nyman needed to be helped off the course after crashing. Ganong nailed the bottom portion of the course, taking the first U.S. men’s victory ever on the famed Kandahar track by 0.38 seconds over Norway’s Kjetil Jansrud and Italy’s Peter Fill. Ganong was behind Jansrud at every split until the last 23 seconds of the course, where he skied from a 0.47 second deficit in the third split to a 0.38 second lead in the finish. His only other World Cup win was in Santa Caterina, Italy, in 2014, an equally challenging venue. Starting bib 12, Ganong endured a lengthy course hold as his teammate Nyman was taken off course following a harrowing crash. The numerous course holds made for a long day for Utah’s Jared Goldberg, who stared bib 52 and just wanted to make it across the finish line before dinner. 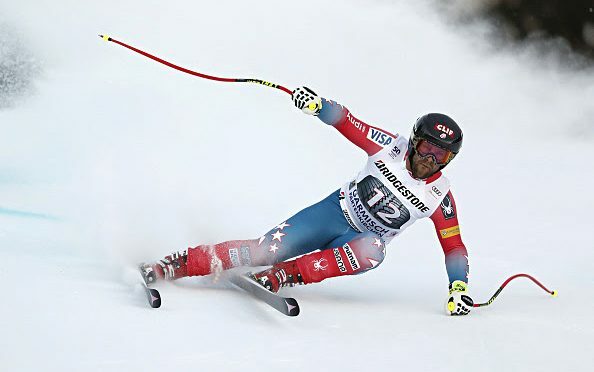 “We were up there for so long, it was getting to the point where I was like, well ‘screw it!’ I wasn’t expecting a whole lot, but I was just going to ski the best I could before dinnertime,” said Goldberg, who attacked the course and finished 12th, a career-best World Cup downhill result. Tommy Biesemeyer, of Keene, N.Y., also posted a career-best World Cup downhill result, finishing 15th from the 47th start position. Eleven of the 55 starters did not finish Friday’s race, which was a make-up event from the race canceled in Wengen, Switzerland two weeks ago, including Norway’s Aleksander Aamodt Kilde and Canada’s Erik Guay, who took a nasty spill – getting thrown backwards as he caught an edge going into a jump. Nyman suffered a left knee injury and some facial lacerations in today’s crash and is flying back to the States for further evaluation. Frenchman Valentin Giraud Moine, who earned second place in the downhill at Kitzbuehel last week, was also evacuated after taking a devastating fall and sliding into the fence. There is no word yet as to the extent of his injuries. 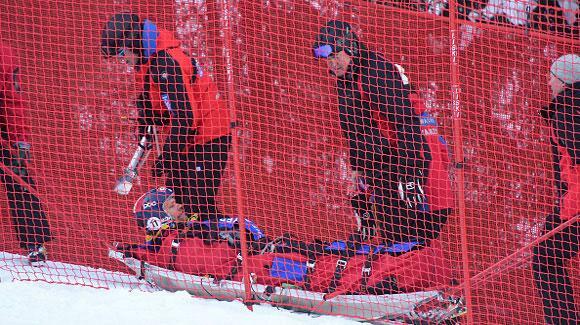 French fellow Guillermo Fayed skied down, but he hit his knee and is likely to sit out the rest of the season. “I think it was so difficult because we only had one training run, and during the training, it was really slow,” Ganong explained. “The speeds were really, really slow and everything skied really easy and everyone kind of relaxed … and today, the speeds were way faster. Up next, the men race downhill again Saturday on the Kandahar track at Garmisch-Partenkirchen.